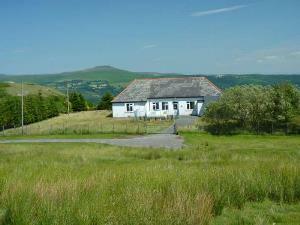 Pwll Du Adventure Centre01495 791577work BunkhouseThe recently renovated accommodation at the Centre has been designed to cater for large groups or extended families. A modern fully equipped self-catering kitchen, makes catering for yourself easy and enjoyable. The kitchen is large and fully equipped to commercial standards, with two sinks, a six ring cooker with double oven, fridge/freezer, microwave and toaster, as well as all the pots, pans and crockery and storage you will need. The dining area is large enough to allow your group to all sit down together to enjoy the results of your labour in comfort and style. There are tables, benches and a fire area in the grounds for parties. A large living room, adds to the friendly social atmosphere. Guests often re-arrange the furniture to meet their needs, creating space for children to put on a play, or for the adults to dance the night away. There isn't another house nearby so if your party goes on into the morning you will not disturb any one. There are seven bedrooms in total, all on the ground floor containing between them 2 double and 20 single beds. Three bedrooms contain twin bunks, which can be demounted. Two bedrooms contain two twin bunks each. And two family bedrooms comprising of a triple bunk, a single bed mounted above a double bed, plus a twin bunk in each. Each bed is provided with its own light and shelf. Full central heating throughout the Centre with individual thermostatic controls for each room ensures you can always determine the temperature inside if not outside. An instant water heater provides plenty of piping hot water. Two less abled bathrooms providing shower, toilet and hand basins are provided plus an additional two separate showers, toilets and hand basins. Drying room which allows you to at least start the day dry! Large outdoor wash-down area for bikes and muddy children. Internal storage for visitor's equipment and kit. The bunk-beds are full size with a deep sprung mattress and we supply a bottom sheet and pillow with pillowcase as standard. Most people bring their own bedding with them, but bedding (a duvet) can be supplied at a small additional cost of £5 per bed for the length of your stay. You will need to bring your own soap and towels, and ensure you are suitably clothed and equipped for the activities you plan and the time of year. We recommend you bring a change of footwear kept specifically for indoor use. A drying room is available for your outdoor clothes and boots. We provide a fully equipped kitchen with storage space for fresh, tinned and chilled food that you may bring with you. There are a number of shops in Blaenavon, 2 miles away and larger supermarkets in Abergavenny and Brynmawr providing a delivery service in this area. Please let us know in advance if you plan to place an order via the internet for delivery to the Centre in case the delivery arrives before you do. The recently renovated accommodation at the Centre has been designed to cater for large groups or extended families. A modern fully equipped self-catering kitchen, makes catering for yourself easy and enjoyable. The kitchen is large and fully equipped to commercial standards, with two sinks, a six ring cooker with double oven, fridge/freezer, microwave and toaster, as well as all the pots, pans and crockery and storage you will need. Drying room which allows you to at least start the day dry! Large outdoor wash-down area for bikes and muddy children. Internal storage for visitor's equipment and kit. Pwll Du is just off the B4246 Abergavenny to Blaenavon road and is signposted at the Keepers pond close to the top of the hill. Follow the road and turn right 100ms after the Lamb and Fox public house.